Kiran has been transitioning from being a princess in the Kingdom Beyond back to being another middle school student. It's hard to return to everyday life after fighting demons and traveling to another dimension. She is also frustrated with the lack of contact from her friends in the Kingdom Beyond (picture Harry Potter when he doesn't hear from his friends all summer at the beginning of The Chamber of Secrets). So when her friend Neel's mother shows up spouting riddles and what seems like rhyming nonsense, Kiran is a bit aggravated. Still, it seems that her friends are in trouble. 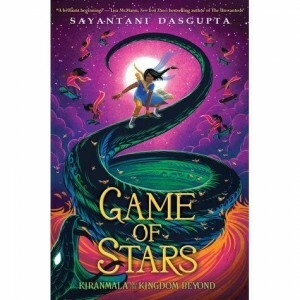 There is something strange going on in a new reality TV show from the Kingdom Beyond, as well as something odd in the behavior of her friend Lal. Why isn't he rescuing his brother? And what is going on between Lal and Mati - who used to be inseparable? And what is up with the rebels in pink saris and riding skateboards? Curiouser and curiouser. 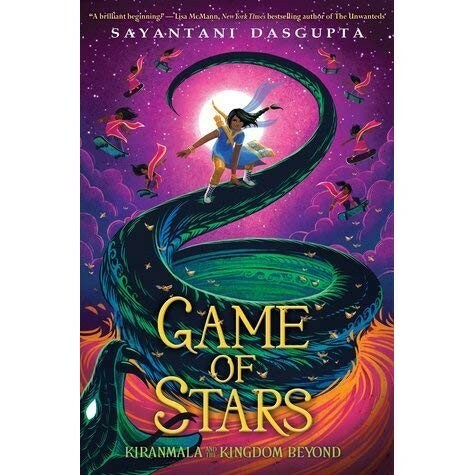 Full of characters from Indian mythology and folklore, as well as references to astrophysics and pop culture, this series continues to entertain with loads of action, humor, and battles of wits. If you haven't read the first book, go back and start at the beginning - you don't want to miss any of the fun.